Travellers to Florence have a choice of two Designer Discount Outlet Malls to shop at. 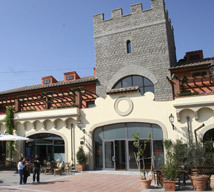 McArthurGlen’s Barberino Designer Outlet at Barberino del Mugello to the north of Florence, is one of these. Those who are famililar with McArthurGlen’s Castel Romano Designer Outlet in Rome will feel very much at home at Barberino. The great thing about shopping at designer outlets in Italy, is that the outlets carry the prestigious Italian brand names that we all so love. Barberino Designer Outlet offers more than 100 stores with 200 designer brand names including D&G, Prada, Jean Paul Gaultier, Les Copains, Missoni, Roberto Cavalli, Ferre, Polo Ralph Lauren, Diesel, etc. You’ll be able to buy designer label clothing, shoes, sports, accessories, electronics and items for the home at discounts ranging from 30% to 70% all year round. There are also restaurants offering Tuscan cuisine, coffee shops, cash dispensers and a large, safe area for the kids to play. Barberino Designer Outlet was designed to resemble a Renaissance town to blend into the beautiful natural environment of Valle della Sieve. If you’re driving here, there are 2,000 car parking spaces at the outlet. The good news for shoppers who don’t like driving is that there are daily shuttle services to the outlet from Florence. Millions of tourists go to Florence each year in search of art, culture and sightseeing so it’s more likely that Florence would be the base for most visitors and an expedition to the Barberino Designer Outlet would fit into their shopping time. There is so much to see and do in Florence itself, however if you have more time , the region is famous for its beautiful countryside including the Lake of Bilancino. Barberino Designer Outlet is located in the beautiful landscape of the Sieve valley some 30 km from Florence and 60 km from Bologna. There are different routes to reach the outlet depending on where you’re coming from. From Bologna – A1 Bologna – Florence section, Barberino di Mugello exit. From Florence – A1 Florence – Bologna section, Barberino di Mugello exit. From Sienna – Take the SS2 to Florence. In Florence, take the A1 towards Bologna, Barberino di Mugello exit. From Luca and Pistoia – Take the A11 to Florence. In Florence, take the A1 towards Bologna, Barberino di Mugello exit. From Livorno – Take the road to Florence, then the A1 motorway towards Bologna, Barberino di Mugello exit. From La Spezia – Take the A12 towards Pisa, turn off onto the A11 for Florence and then the A1 towards Bologna, Barberino di Mugello exit. From Florence – Take the SS65 Strada Statale Bolognese as far as Fiesole, then follow the indications for San Piero a Sieve/Barberino di Mugello. From Prato and Florence – Take Provincial road no. 8 from Cadenzano towards “le Croci”. After le Croci follow the direction for Barberino; at Cavallina turn left for the Outlet. See Related Post on The Mall for the other Florence outlet. For more Designer Discount Outlets in other cities in Europe and the UK , see our Designer Outlet Directory. Enjoy Opera in Florence where it all began. I contacted Barberino and their advice is to catch a train from Montecatini to Florence and then catch their shuttle from Piazza Santa Maria Novella. Departure times are given above. Good luck with your shopping adventure.